My colleague shared her experience when a wildfire was approaching her community several years ago. “In the early morning hours, I woke to a nearby friend’s text saying ‘I can see the flames coming down the hillside. We’re evacuating!’ After racing out the front door, smelling smoke and seeing the hillside pulsing a vivid red, I did what any well-prepared person would do – I panicked! Through my frightened tears, I started searching for a long lost ring I had promised to give my son, grabbed photo albums and framed portraits off the wall, and dug through the desk for important papers. I was not prepared and my panic made it hard to think rationally.” Evacuating your home during a wildfire is a terrifying experience. It’s difficult to think accurately and quickly when faced with the imminent threat of wildfire. With all of the wildfires occurring in the summer and inquiries about packing to-go bags, I thought it might be useful for residents to view a detailed list of what to pack. The following is a checklist of items that individuals should consider packing in their to-go bag. It’s recommended that residents should pack one for each family member, and one for each of their pets. 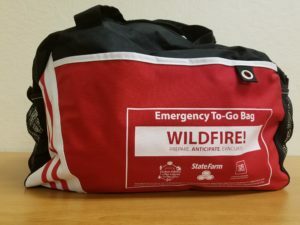 It’s important to note that to-go bags should be prepared BEFORE a wildfire threat begins. Water – One gallon/person/day (3 day supply for evacuation). Food – non-perishable (3 day supply for evacuation). Battery powered or hand crank radio tuned to a local news channel. Sanitation and personal hygiene items (shampoo, conditioner, soap, toothbrush, toothpaste, etc.). Computer back up files, posted on the cloud or saved on a thumb drive. Inventory of home contents. Consider making a list, utilizing a home-inventory app, or videotaping prior to an emergency. Store them on the cloud or keep them in a safe place away from your home. Photographs of the exterior of the house and landscape. Family and emergency contact information. Extra cash, Credit/ATM Debit cards. Family heirlooms, photo albums and videos. Games and activities for children. Ensure you have a picture of your animal in case they are lost during a wildfire. Extra sets of car keys and house keys. Jamie Roice-Gomes is the manager and outreach coordinator with University of Nevada Cooperative Extension’s Living with Fire Program. She earned her Bachelor of Science in Wildlife Ecology and Conservation and a Master of Arts in Interactive Environmental Journalism. She was a public relations assistant for Conrad Communications, a public information officer intern at the Nevada Department of Conservation & Natural Resources, and a Biological Science Technician at the USDA-Agriculture Research Service. She also enjoys volleyball, the Great Basin Desert, and spending time with family. Contact Jamie at 775-336-0261 or roicej@unce.unr.edu. Two things that I love are being active and experiencing the outdoors. One event that combines both of these is to run a one-mile loop through the scenic Bartley Ranch while benefitting fallen firefighters. While I’m not a distance runner by any means, there’s an option to run or walk for a total of one hour that suites my needs. Sunday, May 6 is the Battle Born Trail Series: FIRE UP FOR FIREFIGHTERS Multi-Hour Event at Bartley Ranch. Runners can chose a one-hour, three-hour, six-hour, or 12-hour timed run around a one-mile loop at Bartley Ranch. Runners can challenge themselves by running as many loops in their timed event, or can take breaks in between to visit Smokey Bear and explore fire engines from multiple agencies. There will also be a Wildfire Preparedness and Prevention Treasure Hunt for family members starting at 10:30 a.m. with fun prizes for all. All of the proceeds will stay local to benefit fallen firefighters via the Nevada Local Assistance State Team (L.A.S.T.). L.A.S.T. is a national collaborative effort between the Department of Justice, Bureau of Justice Assistance and the National Fallen Firefighters Foundation. The local Nevada chapter is supported by Federal, State and local firefighting entities. I hope to see you there! Sign up for the multi-hour event. Jamie Roice-Gomes is the outreach coordinator with University of Nevada Cooperative Extension’s Living with Fire Program. She earned her Bachelor of Science in Wildlife Ecology and Conservation and a Master of Arts in Interactive Environmental Journalism. She was a public relations assistant for Conrad Communications, a public information officer intern at the Nevada Department of Conservation & Natural Resources, and a Biological Science Technician at the USDA-Agriculture Research Service. She also enjoys volleyball, the Great Basin Desert, and spending time with family. Contact Jamie at 775-336-0261 or roicej@unce.unr.edu. Working at University of Nevada Cooperative Extension’s Living With Fire Program has altered my perception of the ember threat and proper defensible space. Just the other day, I approached my sister’s house and caught myself secretly congratulating her on her home’s defensible space. One publication that is partly responsible for my increased awareness is “Be Ember Aware!”. It lists twenty locations around the home that are vulnerable to ignition from embers during wildfire and gives suggestions on how to reduce the threat. Contrary to the popular belief that homes ignite due to a large wall of flames, experts estimate that 90% of homes ignited during a wildfire are because of embers. Embers are pieces of burning material that can be carried by the wind more than a mile ahead of a fire. When they land something easily ignitable on or near the house, the home is at risk of burning. I’ve spoken with a few folks who were surprised to hear about the recommendation to keep woodpiles at least 30 feet from the house or other buildings, or changing out their attic or foundation vents to 1/8-inch wire mesh. To learn more about the ember threat view the publication, “Be Ember Aware!”. Pleasant Valley residents scramble to escape as the Andrew fire overruns the south end of Neilson Road. I awoke to the smell of thick campfire-like smoke that had filtered into my bedroom. I jumped out of bed, turned on the bedroom light switch and nothing… the electricity was out. I ran to the window to see the glow of flames cresting the hill on the other side of McCarran Blvd, a major four-lane Reno highway. Since the wind was blowing and the fire was close and spreading, I made the decision to evacuate. Outside, the sky was orange from the wildfire and the street was congested with fire engines and trucks along with vehicles of evacuating residents. Fortunately, I was able to negotiate the chaos safely with my laptop in one hand and some clothes in the other. I’m lucky that my residence and I were unscathed from the wildfire. In the early morning hours of November 18, 2011, this was my experience during the Caughlin Fire. Now place yourself in a wildfire evacuation at your house. Imagine smelling smoke and frantically searching your house for belongings to pack while a wildfire threatens to ignite your home. The electricity is out making your search that much more difficult. Panic begins to cloud your judgement. What would you pack? What if you are unable to quickly find certain items? Have you considered how your neighborhood would evacuate? How many routes can you take to get out? Is there a locked gate that can be unlocked to allow for multiple evacuation routes? Wildfires and evacuations occur and time may be a precious but unavailable commodity. Fortunately, the best way to ease these evacuation concerns is to plan and prepare. As a resident who has experienced two separate wildfires, you can bet I’ll be there! Recently, I had a defensible space inspection performed on my property by Nevada Division of Forestry’s fire protection officer, Chanse Hunwardsen. Chanse noted some problem areas that I have previously addressed in former blogs, and he also addressed some issues that I had not considered. Watch this video to learn what issues were found and how to resolve them. To learn more about our interactive defensible space graphic, check it out here. Jamie Roice-Gomes is the outreach coordinator with University of Nevada Cooperative Extension’s Living with Fire Program. She earned her Bachelor of Science in Wildlife Ecology and Conservation and a Master of Arts in Interactive Environmental Journalism. She was a public relations assistant for Conrad Communications, a public information officer intern at the Nevada Department of Conservation & Natural Resources, and a Biological Science Technician at the USDA-Agriculture Research Service. She also enjoys volleyball, the Great Basin Desert, and spending time with her husband and their mini Australian Shephard. Contact Jamie at 775-336-0261 or roicej@unce.unr.edu. If a fire destroyed your home, would you be able to remember the estimated value and age of all your possessions for insurance purposes? Yea, me neither! Since September is National Preparedness Month, I started an inventory of my personal belongings. It’s important as it provides an accurate record of a homeowner’s possessions, helps process insurance claims faster, and helps one purchase the correct amount of insurance. The inventory is critical to document losses due to fire but also to other causes such as flooding, burglary, and vandalism. Below I review three recommended methods to inventory one’s belongings. While there may be other options, the important thing is to pick one and become prepared during National Preparedness Month! A representative from the Nevada Division of Insurance recommended utilizing either a free smart phone app or a PDF inventory sheet created by the National Association of Insurance Commissioners (NAIC). In addition, the Living With Fire (LWF) Program also has a more detailed inventory sheet. One can always install the app on their smart phone by searching for Scr.APP.book (see above). The app’s interface is very user friendly and makes it easy to upload photos. Once the app is installed, click the icon, “ADD ITEM” and complete the screen (see above). One can take multiple photos of the item by clicking the camera button at the top, taking a photo and then clicking “OK”. The information entered on the form can be retained by clicking the save button. To view the items already input into the form, click the item list and edit information if necessary. An individual form must be completed for each item in the home. This information can then be exported from the app to be e-mailed, or saved to a computer or flash drive. Additionally, there are tips and resources on the app to connect to the NAIC and become more informed regarding advisable insurance coverage. Unlike the NAIC form, item information can be entered and edited directly on a computer and can be saved to a drive, thumb drive, etc. (see above). This inventory sheet asks for more information than the NAIC options, BUT also provides users with a more detailed inventory of belongings. The inventory sheet suggests considering items that I normally wouldn’t have, including silverware, clothing, tools, and recreation equipment. The LWF Program inventory also explains how to calculate the current cash value of items and recommends including this as part of the record. While calculating the current cash value of each item isn’t necessary, it helps to estimate the item’s worth for insurance reimbursement purposes. As with the NAIC PDF inventory sheet, pictures must be taken of the items and attached or saved to the PDF. To download this method, click here: http://www.livingwithfire.info/how-we-can-help and scroll down to the “Household Inventory Program” tab. Out of all three options, I felt that the smartphone app was by far the easiest to use because my smart phone’s camera is linked to the app. The app stores the photos and inventory information all in one place. If I were to complete the other two inventory sheets, I would need to take a photo of each item, print it out, or save it digitally and link it to the completed form. However, I do recommend reviewing the Living With Fire Program’s inventory sheet as it made me consider adding other items that I wouldn’t have otherwise considered. Overall, this process is very time consuming as it took me a total of two hours to document only six items on the app. It’s recommended to inventory one’s belongings for a couple of hours each weekend to prevent documentation burn out. I began my inventory process with the larger, more recently purchased items however after reviewing the LWF inventory, I’ll need to include more of a detailed list such as my silverware and clothing. I’ve started keeping copies of my receipts for my purchased items, making it easier to look up the brand, item’s name, price, etc. Remember it’s better to have an incomplete list rather than no list at all. Once your list is complete, store it in a safety deposit box, save a digital copy, or place a copy with a trusted friend or family member. Just ensure the inventory is not destroyed if your house is a total loss. Jamie Roice-Gomes is the outreach coordinator with University of Nevada Cooperative Extension’s Living with Fire Program. She earned her Bachelor of Science in Wildlife Ecology and Conservation and a Master of Arts in Interactive Environmental Journalism. She was a public relations assistant for Conrad Communications, a public information officer intern at the Nevada Department of Conservation & Natural Resources, and a Biological Science Technician at the USDA-Agriculture Research Service. She also enjoys volleyball, the Great Basin Desert, and spending time with her husband and their mini Australian Shepard. Contact Jamie at 775-336-0261 or roicej@unce.unr.edu. Most homes are destroyed during wildfire by burning embers landing on, in or near the house on something easy to ignite. In this photograph, embers have ignited the house and started several spot fires in the pine needle litter. Photograph courtesy of North Lake Tahoe Fire Protection District. Have you scrutinized your homeowner’s insurance policy to confirm that you are not underinsured if a wildfire destroys your home? OR did you know that a majority of homes destroyed during wildfire are from embers that can travel up to a mile away from a fire? As a relatively new employee with the Living With Fire Program, I am still learning new things! Some misconceptions continue to surprise me. The following is a list of four common misconceptions I hear regarding wildfire. Read on and be prepared to be debunked! – Myth 1: If a wildfire destroys my home, my insurance will build me a new home. Let’s say an individual’s home is destroyed by wildfire. Most homeowners expect their insurance will help them recover from the fire by providing enough money to replace anything damaged or destroyed. According to an expert I spoke with at the Nevada Division of Insurance, a majority of homeowners are under insured or don’t fully understand their insurance coverage. Of the many possible examples, let’s use the car as an example. Say a homeowner is evacuated due to a wildfire, but must leave one car behind parked in the garage and both the car and house are destroyed. The car is not covered by homeowners insurance, and is only covered if the owner has comprehensive auto insurance. This is but one of the many situations to review under your homeowner’s insurance policy. Remember, different insurance companies offer different policies. Due to this wide variation, homeowners should review policy details with their agent or at the very least, thoroughly read their annual policy. For an overview of homeowner’s insurance, please review the Nevada Consumer’s Guide for Home Insurance published by the State of Nevada Department of Business and Industry Division of Insurance, http://doi.nv.gov/uploadedFiles/doinvgov/_public-documents/News-Notes/HomeInsuranceGuide2011B.pdf . – Myth 2: Firefighters will save my home during a wildfire. -Myth 3: During a wildfire, I’ll defend my home using my lawn sprinklers and a garden hose. – Myth 4: Direct contact with the wildfire flame front is why most homes are destroyed. After experiencing the recent Driscoll Fire, (click here to view last month’s blog) it becomes even more important to continue my efforts to make my home wildfire prepared. I look to the publication, “Be Ember Aware!” for ideas on how to reduce the wildfire threat to my home. This publication contains a list of 22 places around the home that can be vulnerable to ignition by windblown embers produced by a wildfire. During a wildfire, embers can be blown over a mile away from the main flame front and can bombard a home easily igniting these flammable spots. In fact, embers are the major reason why homes are destroyed in wildfires. I won’t review all 22 of the vulnerable areas, but will note some of my home’s problem areas that require attention. Once I removed the cedar tree in the front yard, (click here for my first month’s blog) it was apparent that our foundation vent had a hole in it and needed to be covered with 1/8-inch wire mesh. If embers were pelting my house, the hole in the vent would have provided an easy entry for embers to blow into the crawlspace and ignite the home. The hole in the crawlspace vent. UGH, my weathered deck. Unfortunately, my husband and I have yet to replace or maintain our deck. All decks should be in good condition to resist ember ignition. It’s also a good idea to remove all combustible debris out from under the deck as those are a fire hazard. Even the accumulated litter between deck floor boards can be a source of ignition from embers. A few months ago, my husband and I purchased wooden lattice panels to enclose the deck. However, the publication recommends using “ignition-resistant siding materials”, or 1/8-inch wire mesh to prevent debris and embers from blowing under the deck – I guess we won’t be using those panels. The condition of my deck. Also note the open space between the deck and the ground. A view beneath the deck. The dead vegetation under the deck must be removed. My home “to-do” list continues to get longer and longer but at least I have an idea of how to keep my home safe from embers. For a full list of vulnerable, flammable areas of your home check out the “Be Ember Aware!” publication (click here for the “Be Ember Aware!” publication) Also, keep an eye out for more of my lessons and experiences with these blogs. Did you know that I grew up in Illinois? Yup… the good ol’ Midwest. We don’t live with the threat of wildfire in that neck of the woods – our “gift” from Mother Nature comes in the form of a mighty whirlwind called a tornado. When I moved to Reno, I thought I had mostly escaped tornadoes … but did you know there is such a thing as a “fire tornado” … otherwise known as a “fire whirl”? This event, although rare, is highly destructive and occurs when a fire is whipped up by strong, hot, dry air currents to form a vertical whirl – literally creating a tornado full of fire! Their occurrence is not only visually spectacular but alerts firefighters of very unstable air and extreme fire behavior. Fire whirls can uproot trees and can carry flaming debris great distances! Some of the largest fire whirls can be more than half a mile tall, produce winds over 100 mph and last for more than 20 minutes. Not surprisingly, these flaming tornadoes can ignite new fires by moving into unburned territory. Fire whirls are so threatening, that virtually all state forestry services include fire whirl basics in their training. I don’t know about you, but I am happy that I won’t have to deal with them anytime soon. It definitely helps me to appreciate my firefighters that much more and peaks my awareness level about MY part in being prepared for wildfires. Remember, that while our friend Smokey Bear says … only YOU can prevent wildfires, it is also true that only WE can prepare our homes for wildfire when it occurs. Check out how you can prepare your home for wildfire here! Do you have any experiences with fire whirls? Please share your stories in the comments below! 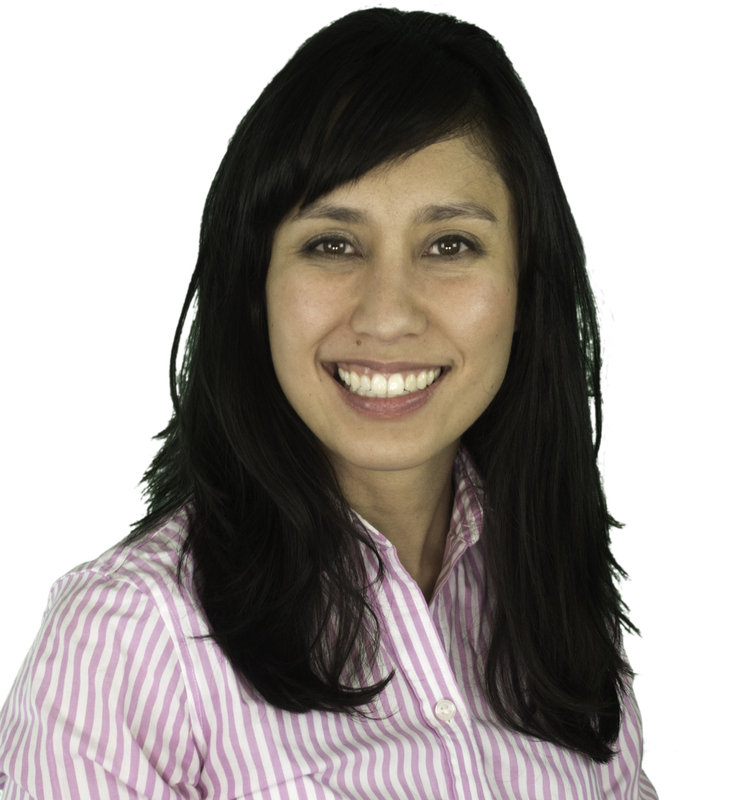 About the Author: Jenny Digesti is the Assistant for the Living With Fire Program. You can follow her on twitter here. Am I Prepared for Wildfire? I was talking with my friend, Jed Horan, from the North Lake Tahoe Fire Protection District and he suggested I write a blog on the importance of having an evacuation plan, knowing a route out of my neighborhood and what to do if that evacuation route was blocked. Preparing for an evacuation is not a simple “one-size-fits-all” topic. Who would my husband and I contact? And how? Where is our escape route and safe place? Do we know how to turn off the water, gas and electricity? What if our dog, Bella, was at doggy daycare? Do they have an emergency response plan? Don’t forget about pet food! I don’t know about you, but I am glad my Living With Fire teammates brought this to my attention. Wildfires are inevitable – so preparing for them in advance can help ease your stress a bit. I’ve got a lot of planning ahead of me, but feel free to follow me and join in on my journey as I tackle each one of these steps. I’ll keep you updated on my progress here and you can help hold me accountable! Meanwhile, I’m still working on my defensible space from last month … click here to see that post. What about you? Are you prepared for a wildfire evacuation? Do you have any tips to help me prepare?